The Aboard Shop Floor Scheduler (SFS) produces production schedules for both batch process and discrete manufacturing factories. The schedules are typically much better than the human-made schedules for the same load of production work orders. This is equivalent to expanding the factory at no cost, because it gets more production from the same factory resources and team. It achieves the optimizing goal of producing the most output with the available factory resources like machines, holding tanks, factory workers, etc., by leveraging simultaneity in the use of the available resources for processing the production work orders. Factory resources like tanks, machines or even factory workers are used whenever they are available. 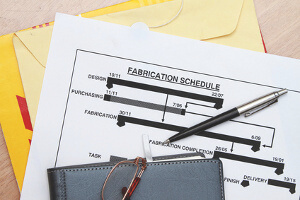 Many production work orders are in process simultaneously, and each uses factory resources which the others don't need at a particular moment. Each production work order consists of a set of tasks, not independent from each other because the production process must meet certain rules, like not letting a certain mix stand waiting for too long to be used in the next production task of that same order. The SFS allows users to specify bills of resources, change over times and item attributes that are used for the rules determining the change over times. The bills of resources specify the resource requirements of the different items to be produced, including how to calculate the time of use of each resource when the production order quantity increases or decreases. Based on parameters that describe the factory restrictions, like resource availability, change over times for cleaning resources or connectivity between different tanks, machines or other resources and the Item production procedures, the system then calculates solutions for the scheduling of the production work orders for a certain user-defined time period like a week. As the production work orders involve several steps and several resources, the possible scheduling combinations grow exponentially, making it impossible to test all possible combinations to find the optimal schedule. Our software uses a trial and error backtracking algorithm to selectively traverse the combinatorial tree graph of possible partial schedules, pretty much like a basic chess-playing software algorithm would expand and discard possible moves. We also apply some heuristic criteria that ensure we arrive quickly to a viable solution, and then the system proceeds to calculate other solutions which are better than the last solution obtained. This process can be run for hours and will increase the effectiveness of each new schedule solution found, but it typically produces a very good solution, much better than the human-made schedules, in about 5 or 10 minutes. Typically, the refining of the solution after the first half hour is marginal, and schedules that are subsequently produced are almost the same in terms of effectiveness.